"While Nokia is perhaps most recognized for its leadership in the mobile phone market, they have successfully demonstrated their knowledge of the Internet security appliance market and its customers requirements." --Chris Christiansen, Vice President, Internet Infrastructure and Security Software, IDC. Syngress has a long history of publishing market-leading books for system administrators and security professionals on commercial security products, particularly Firewall and Virtual Private Network (VPN) appliances from Cisco, Check Point, Juniper, SonicWall, and Nokia (see related titles for sales histories). The Nokia Firewall, VPN, and IPSO Configuration Guide will be the only book on the market covering the all-new Nokia Firewall/VPN Appliance suite. Nokia Firewall/VPN appliances are designed to protect and extend the network perimeter. According to IDC research, Nokia Firewall/VPN Appliances hold the #3 worldwide market-share position in this space behind Cisco and Juniper/NetScreen. IDC estimated the total Firewall/VPN market at $6 billion in 2007, and Nokia owns 6.6% of this market. Nokia's primary customers for security appliances are Mid-size to Large enterprises who need site-to-site connectivity and Mid-size to Large enterprises who need remote access connectivity through enterprise-deployed mobile devices. Nokia appliances for this market are priced form $1,000 for the simplest devices (Nokia IP60) up to $60,0000 for large enterprise- and service-provider class devices (like the Nokia IP2450 released in Q4 2007). While the feature set of such a broad product range obviously varies greatly, all of the appliances run on the same operating system: Nokia IPSO (IPSO refers to Ipsilon Networks, a company specializing in IP switching acquired by Nokia in 1997. The definition of the acronym has little to no meaning for customers.) As a result of this common operating system across the product line, The Nokia Firewall, VPN, and IPSO Configuration Guide will be an essential reference to users of any of these products. Users manage the Nokia IPSO (which is a Linux variant, specifically designed for these appliances) through a Web interface called Nokia Network Voyager or via a powerful Command Line Interface (CLI). Coverage within the book becomes increasingly complex relative to the product line. 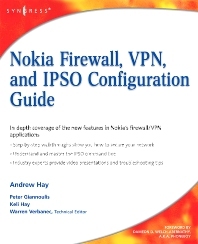 The Nokia Firewall, VPN, and IPSO Configuration Guide and companion Web site will provide seasoned network administrators and security professionals with the in-depth coverage and step-by-step walkthroughs they require to properly secure their network perimeters and ensure safe connectivity for remote users. The book contains special chapters devoted to mastering the complex Nokia IPSO command line, as well as tips and tricks for taking advantage of the new "ease of use" features in the Nokia Network Voyager Web interface. In addition, the companion Web site offers downloadable video walkthroughs on various installation and troubleshooting tips from the authors. Network administrators, IT Security professionals, IT Security auditors, IT Security consultants. Andrew leads a team of software developers at Q1 Labs Inc. integrating 3rd party event and vulnerability data into QRadar, their flagship network security management solution. Prior to joining Q1 Labs, Andrew was CEO and co-founder of Koteas Corporation, a leading provider of end to end security and privacy solutions for government and enterprise. His resume also includes such organizations as Nokia Enterprise Solutions, Nortel Networks, and Magma Communications, a division of Primus. Andrew is a strong advocate of security training, certification programs, and public awareness initiatives. He also holds several industry certifications including the CCNA, CCSA, CCSE, CCSE NGX, CCSE Plus, Security+, GCIA, GCIH, SSP-MPA, SSP-CNSA, NSA, RHCT, and RHCE. Keli is a certified professional instructor through Freisen, Kaye and Associates, with over 15 years experience in IT. She also has a diploma in Business Administration with a major in Information Systems. Keli is currently working as an Instructional Designer, primarily for a large, global IT client, and is based in Fredericton, New Brunswick, Canada. In other roles, Keli has provided technical support and training for company specific and third party products, provisioned client services, provided customer service, and audited IT services. Keli's employers include PulseLearning Inc., Computer Sciences Corporation (CSC), Nortel, and Magma Communications, a division of Primus. Keli also acted as a technical editor consultant on OSSEC Host-Based Intrusion Detection Guide (ISBN 978-1-59749-240-9). She enjoys learning and writing about and helping to train people on different products. Peter is an information security consultant in Toronto, Ontario. Over the last 10 years Peter has been involved in the design and implementation of client defenses using many different security technologies. He is also skilled in vulnerability and penetration testing having taken part in hundreds of assessments. Peter has been involved with SANS and GIAC for quite some time as an Instructor, Authorized Grader for the GSEC certification, courseware author, exam developer, Advisory Board member, and is currently a Technical Director for the GIAC family of certifications. He currently maintains the first information security streaming video website (www.theacademy.ca), which assists organizations in implementing and troubleshooting some of the most popular security products. Peter's current certifications include: GSEC, GCIH, GCIA, GCFA, GCFW, GREM, GSNA, CISSP, CCSI, INFOSEC, CCSP, & MCSE.